Dundonald Links originally set out to be part of a golf and residential complex called Southern Gailes but when that didn’t happen, Loch Lomond Golf Club stepped in to snap up the course for its members in 2003, commissioning Kyle Phillips to put the finishing touches to the design. Dundonald translates to “Fort Donald” and fortifications have been located near here dating as far back as 200 BC. A golf course existed on the site in the 1900s but this was later turned into a military station named Dundonald Camp. It was here that D-Day landings were rehearsed during the Second World War. Only opened in 2005, Dundonald has since proved to be a links of some repute and was the proud host venue for the 2017 Scottish Open, which Rafa Cabrera-Bello won in a play-off. If you like the pampering that goes with golf at the top tracks then this is the place to enjoy such millionaire’s golf for a relatively modest green fee. The Dundonald experience begins at the gatehouse when the security man lifts the barrier to let you in – everyone from then on seem to know your name. It’s a mirror of the treatment you get at Loch Lomond, but the course here on the Ayrshire coast is a true links layout and the polar opposite of the private layout on the shores of the famous loch. I played this course from the blue tees (over 6500 yds) in windy, dry conditions. The course was being prepared for The Scottish Open, and was in superb condition. The fairways were firm and the greens were fast and tricky, with some difficult pin positions especially on the par 3's. The golfing challenge is stiff but fair, and you need to put the ball into the right areas for a good approach to the large undulating greens. My favourite holes at Dundonald are 1, 6, 11, 12 and 16 - though all 18 are well designed by Kyle Philips. I would strongly recommend that you visit and play this excellent links course. A truly lovely spot to play the game of Golf. Wonderfully laid out with super fast fairways and great greens (usual for this part of Scotland). A shame that the sea isn't overly visible or in play, but that doesn't detract from a superb experience all round. Highly recommend a visit. In an area steeped in history and tradition Dundonald Links has, in the space of just over ten years, commanded the respect of golfers who flock to this part of Scotland to tackle Open Championship venues and other prestigious links courses. Wedged between Gailes Links, Kilmarnock Barrasie and Western Gailes, and just up the road from Prestwick, Troon and Turnberry it is testament to the course that is has also gained the appreciation from neighbouring courses as well. Created in 2003 this is essentially faux links. It has been created by man and manufactured to replicate the natural sandhills and rolling terrain of nearby courses. The man who played God was Kyle Phillips who also has The Grove in Hertfordshire and Kingsbarns in Fife on his United Kingdom CV. He has done a remarkable job with what was a flat piece of land for Dundonald Links appears to have been there for over a century, certainly to the untrained eye. The shaping of the sandhills and dunes took three years alone and the result is they (almost) look as if nature created them. Many decades ago the site originally housed Dundonald Golf Club but it fell into disrepair around the time of the two World Wars and eventually returned to wasteland. Then at the turn of the millennium a new course was conceived; Southern Gailes. But before that could open the owners of Loch Lomond Golf Club snapped up the site, appointed Phillips, renamed it Dundonald Links and the rest is history. There’s not much eye contact with the sea at Dundonald but on this highly playable course, thanks to wide fairways and large greens, you will encounter pine trees around the periphery of the course, small patches of gorse throughout and deadly bunkers. The site is not hilly but offers pure and traditional links golf with plenty of undulations on a course that belies its age. 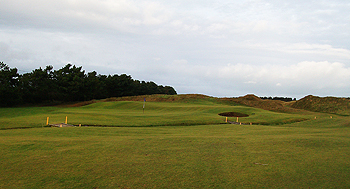 Dundonald is a course that is maturing well and stands in very good stead for the future. Im glad Dundonald has consolidated its position in the Top 100 (only Golf Monthly does not include it). Every hole is strong – my standouts include 1, 5, 10, 11, 14 & 15. The 18 is a worthy last hole. Removing all the trees, especially to the right of 9 would in my opinion enhance the course bearing in mind that Western Gailes has nabbed the best land in the area and every effort to stress the links nature of the course should be made. Played with a member and really enjoyed the course depsite not playing too well. As with other courses by same designer it is playable and fair for us mortals and has the wind and tiger tees for the big boys when's you need to toughen it up. Some great holes and some great greens. Well worth a visit. This course really is your default weekend morning choice unless you play with a member somewhere else or stay at Turnberry. As such we played it after Glasgow Gailes and Western Gailes, which is a shame as it is the ideal opener for an Ayrshire links golf trip with its wide fairways. Mind you, it still has got teeth, especially when the wind is up, which was very much the case when we visited in mid-May 2015. Without ever emulating the fantastic views of Kingsbarns or Castle Stuart, this course shares the modern? philosophy of creating more difficulty in getting close to the pin rather than in finding your tee-shot in the rough, which is a philosophy I fully subscribe to, having almost played 36 holes with the same ball after losing half a dozen in the rough at Western Gailes and the heather at Glasgow Gailes. The hole we will all rememember is the par 3 15th which played a full driver from 155 yards(!) into a very stiff breeze, but three of us still found the green and made our pars. Seriously good course, paper mill not as intrusive as I remembered...gosh its tough though....will continue to rise up as the continue to tweak it....only tiny criticism, do the bunkers all need to be that deep, really? If you play here you will LOVE it. From the championship tees Dundonald is a serious test of golf. For example, the opening hole is a par four of 465 yards and is 435 yards from the medal tee. The first par three is the 4th hole, which is a very testing 220 yards. The 6th is one of the best holes at Dundonald. This lovely par three of 170 yards has a wet ditch running down the left side. Anything pulled left of the ditch will be in long grass. The green is elevated with dunes at the back where there is a small pot bunker. The run home from the 15th features four very demanding holes. Fifteen is a par three of 215 yards with a gully and then a raised green with several penal bunkers at the front left. Index 1 is the 16th, a long par four of 485 yards. The green is on two levels and has a bunker on each side. Seventeen doglegs to the left so you need a draw with your drive. The 18th is the longest hole at 585 yards. There are a number of pot bunkers to catch your drive and three cross bunkers are in place for the second shot. A burn runs in front then along the right edge of the green. 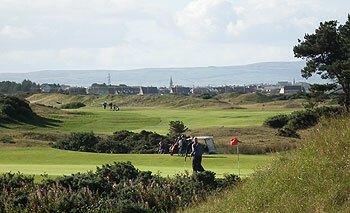 On a recent visit to Troon we played Dundonald and had a very enjoyable day. More generous than the other courses we played (Irvine, Western & Glasgow Gailes) you have a chance here of getting the same ball around. The starter was very friendly and informative, the sprinkler heads have the distances to the front of the greens on them and the scorecard tells you if the pin is front, middle or back, both very useful. The course was in great condition with a fine array of holes. Of the Par 3’s two were lovely holes of under 140 Yards and the 15th was a brute into the wind, barely reachable with a fairway wood. The greens allow for some challenging pin positions, the one on the Par 5 fifth was a rascal needing plenty of imagination to get near but the Par 5’s will give you a birdie putt if you play three solid shots. Since our last visit the gorse on the brow of the hill on the right of the 10th has been removed resulting in less time spent ball hunting. The course is defended by bunkers, not narrow fairways and deep rough allowing for a more enjoyable game. The Par 4’s really are a great mix. I would recommend this course to anyone, you will enjoy the challenge it sets. Today was my fourth game at Dundonald and I must confess that I’d never really paid too much attention to the green sites or their contours in my previous visits. Not so today as I was struck by the really tough pin position on the very first hole, as this got me wondering where else could the hole have been cut to make it any more difficult! And it was only as the round progressed that I came to fully appreciate how challenging many of the putting surfaces were. It might be less than a week to Christmas and we’ve had some horrendously bad weather in recent days but – apart from large puddles on the fairways at holes 10 and 15 and casual water in many of the bunkers, to be fair – the course was in remarkable condition. Greens, in particular, were of a standard that many a club would be proud to boast of at the high of their summer season. The front nine grows on me the more I play it (although the par three 4th remains the weakest hole by far on this loop), and it ends with a terrific par four played to a shallow green that sits behind a sneaky wee burn. The short par four 12th is another fine two-shot hole where the severely rumpled fairway leads to an elevated green that was framed this morning by the snow-covered mountains of Arran across the Firth of Clyde – what a bonnie sight! Over the last couple of years, Dundonald seems to have opened its doors to a more inclusive golfing clientele through its promotion of reasonably priced green fees so fair play to the club for charging sensible sums of money for what is clearly a superior links product, even in the middle of winter.